A Global Economic Collapse Is Likely...Who Will Bring It Down First??? We are not the only country saddled with humongous debt. The European Union is also scrambling to stave off the inevitable collapse as well. All of the European countries are having financial difficulties, but it is Greece and a few other countries and their unwillingness to give up their way of life and comforts that may indeed pull the final straw. It is no secret the the world economy is in a tough time right now. What is difficult for all of us is that the longer the world governments keep meddling with the economy and propping it all up with dollars and euros, the money is devaluing faster than they can print it. What may bring the EU down faster than us is the fact that the European Union is not a solid single governmental body like the US, nor is the euro the defacto "world currency". It is an informal group of countries that, via an agreement, decided to trade in their own currency for the euro, so they would be able to trade with each other a lot easier. The problem arises when a lazy country like Greece, decides that they want to retire early and have longer vacations than their Euro-neighbors. By not being a single solid body, economically stronger countries like Germany and France could get fed up with the others and drop the euro in favor of their own currencies again. If that happens, the euro could crash virtually overnight because it's countries like Germany and France who are propping up the euro, keeping it afloat. If that were to happen, Germany and France would also be hurt by the euro crash, but would be able to rebound more quickly than the others. In the US, States are sovereign entities. If, say, California, or Michigan, or Illinois, or New York were to become totally insolvent (which is about where they are now), their failing would not necessarily affect the US dollar. Whomever bought bonds, had government pensions, etc. would lose, but the federal government is not responsible for the state's obligations. The federal government levies taxes 'in addition' to the states themselves. The European Union is more of a cooperative. The EU is supported by the countries, not by individuals via say, an income tax. Each country funds the EU directly as a country. The EU then sets up guidelines for all of the countries to follow regarding commerce between countries, much like we do here in the states. If you buy something from another state, you pay your state's sales tax, not the other state's. California would have a difficult time trying to secede from the US, but Germany can do so fairly easily. Of course they would be the subject of ridicule, sanctions, etc. by their neighbors, but if they can operate self sufficiently without the others, even if difficult, it may be in their best interest to maintain their own solvency. So, for now, it's a race between the US, EU, China, Japan, and the Soviet Union to see who can last the longest without causing the collapse. Though if any one of them crash, we all crash! Our markets are too intertwined to be able to insulate any country from the collapse. Does that make you feel any better about our economic situation? I didn't think so. Which Makes a Better Investment: Gold or Canned Soup? Question: What good is gold? In your article on John Williams, you mention that he thinks gold is the best bet around. But if we are talking about economic collapse brought on by hyperinflation and the government being unable to meet its obligations, what does owning gold do for a person? You can't eat it, live in it, use it for transportation...If John Williams is really that worried about the future, shouldn't he be advising his customers to buy canned food? Paul Solman: Oh, I imagine John has a fair trove of canned food around somewhere, as do I. (In the interest of full disclosure, mainly in the form of Progresso soup.) That's because you never know what form a Black Swan might take in the short run. As to the longer run, gold bugs like Williams are betting that, in a hyperinflationary environment, the metal will retain its trading value and will thus replace paper money as the medium of exchange, a role it has played so durably throughout history. Is that really nuts, as you suggest? On the other hand, the price of gold, in dollars, has been plunging the past few days. As the world's investors fret over the fate of Europe and the world economy, they have flocked to the U.S. dollar. That means buying dollar-denominated securities like bonds. That increases the demand for dollars, which drives up the dollar's price, all else equal. As the price of the dollar rises, the price of anything priced in dollars goes down. (Again, all else equal.) That's presumably one reason gold, priced in dollars, has been melting. Another presumed reason: as already explained, gold is the ultimate hedge against future inflation. But if you begin to expect DEflation -- a diminution of economic activity and thus a drop in prices -- gold is one heck of a lousy investment, Mr. Myrick, just as you suggest. 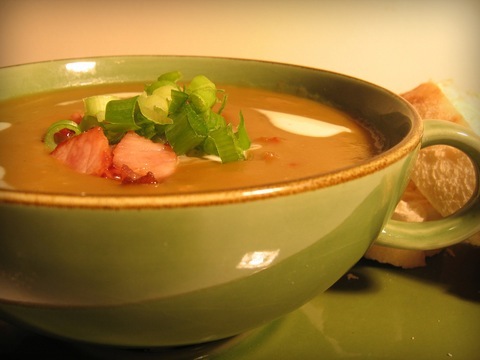 Photo of a bowl of split pea and ham soup by flicker user Kat Johnston / Sanura Sakai. This entry is cross-posted on the Making Sen$e page, where correspondent Paul Solman answers your economic and business questions. Forecast For Tomorrow, a leading trend forecaster, has today warned of the imminent US dollar collapse and issued a warning to all constituents to take appropriate steps to protect their wealth. Forecast For Tomorrow has earned a distinguished reputation in the industry through accurate, insightful forecasting of world-shaking events before they happen. Forecast For Tomorrow identifies trends and has forecasted world-shaking events far ahead of time. Events accurately predicted by the group include the election of Barak Obama as US president in 2008, as well as the stock market crash of 2008 and the swine flu pandemic outbreak. Their accurate predictions have provided sound protection for thousands of people, allowing them to protect their wealth and even increase their financial standing substantially at times when others are losing everything. The stock market crash of 2008 alone was responsible for the financial devastation of millions of people. Economic predictions for 2012 issued by Forecast For Tomorrow highlight the fact that the devaluation of American currency will lead directly to a US dollar collapse. This economic collapse could spell doom for any investments in the stock market, bonds, CDs and other “traditional” investment methods. However, Forecast For Tomorrow has provided the framework necessary to not only protect an investment, but to help foster growth even amidst an economic collapse. The firm’s economic predictions for 2012 are bleak for those who do not take the appropriate action now. A possible US dollar collapse could cause immense harm to millions of people, and a new currency will be ushered in. Preparing now is the only way to avoid that fate. To find out more about economic predictions for 2012, visit the company at http://www.ForecastForTomorrow.com. About Forecast For Tomorrow: Forecast For Tomorrow has garnered immense global respect for the accuracy of their predictions. Utilizing advanced software and data analysis tools, Forecast For Tomorrow identifies developing trends and advises individuals and numerous high-ranked firms for strategic planning. Could Intense Solar Flares Meltdown Nuclear Reactors Everywhere?